Hey Rod... you really are Nico Rosberg aren't you?? Zag a écrit: Hey Rod... you really are Nico Rosberg aren't you?? Forget who pitted first or second and the sloooow tyre stops, Lewis drove the wheels off trying to catch Nico and when he finally did (after a mistake from Nico on the previous corner) Nico didn't bother to turn and purposely speared Lewis off the track. 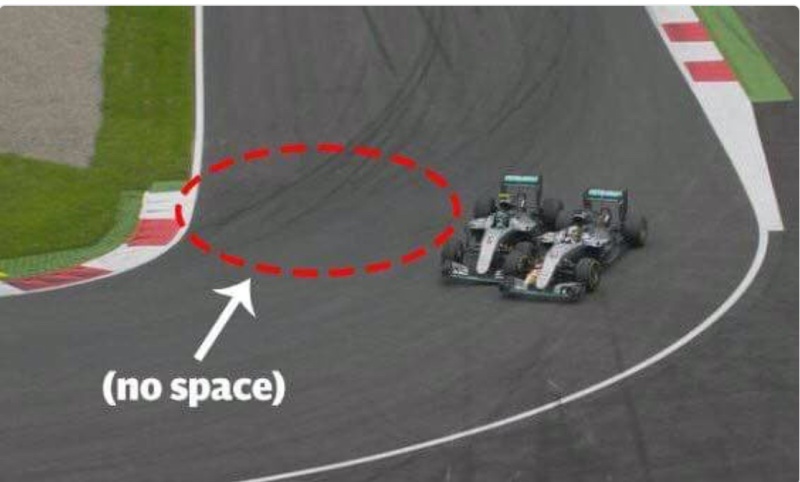 Oh dear, it really was very different to this... Nico chose the two stop strategy and was even allowed to pit before Lewis even though it was his call... Nico was in effect given a ten lap undercut on better tyres and then they decide Lewis has to stop twice. we wouldn't be discussing this now, he would have won at a canter..
By a growing list of favours do you mean giving Lewis a car that has been more unreliable than reliable in the majority of races/qualifying and meaning even more penalties down the line? Pretty amazing. Lewis has a great start from pole, great pace on track, and yet, Mercedes manages to put Rosberg from P7 ahead of him (strategy change, slower pit stops etc.). Hardly a race goes by where they're not screwing him one way or the other. He got so close to falling behind even further in the championship after what was a perfect weekend by him. Also interesting that Nico's only defense these days seems to be to run right into his teammate at every opportunity. Here's hoping that for a repeat offender, the penalties become more meaningful going forward. Giving him meaningless penalties will hardly make him re-think his approach. Zag a écrit: Oh dear, it really was very different to this... Nico chose the two stop strategy and was even allowed to pit before Lewis even though it was his call... Nico was in effect given a ten lap undercut on better tyres and then they decide Lewis has to stop twice. Great race if you ask me. Just missing those few drops of rain! Nico with apparent brake problems, but didn't turn in either! He suffered in the end. Great race from Max and Button. Poor race from Hulk, Ricciardo was kinda nowhere and Kimi really should have been closer to Max by the end of the race, reminded me of how Trulli would fall asleep in the middle of races. 5 laps to go amd suddenly "where are blue flags". Nico Rosberg has been handed a ten second post race time penalty for his role in the last lap crash with Lewis Hamilton, along with two penalty points on his liscence. The penalty does not affect the overall classification of the race, as Rosberg finished 14.271 seconds ahead of Daniel Ricciardo in fifth position. Rosberg also received an official reprimand for continuing to drive around the circuit with a damaged car, as this contravenes Article 22.11 of the Formula One Sporting Regulations, which “requires a driver with serious mechanical difficulties to leave the track as soon as it is safe to do so”. Perhaps the clearest view yet. (Amateur video). 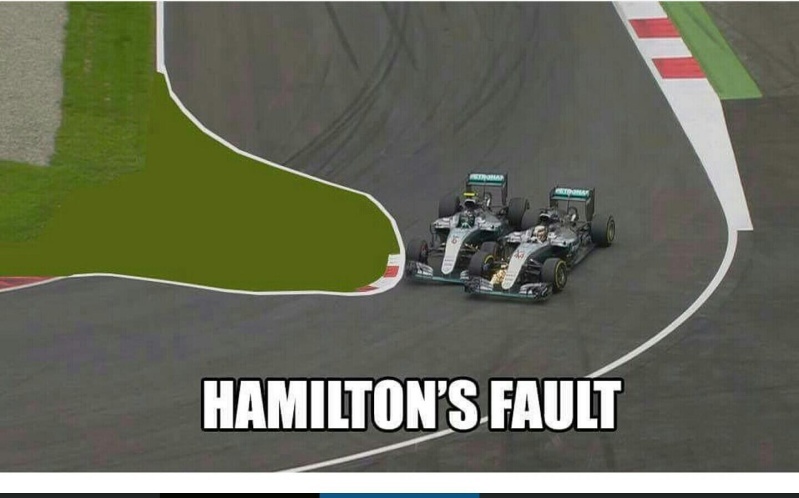 to take the corner and purposely spearing Hamilton is disgraceful. big the lies he is telling are beggars belief. I had little regard for the guy before this and now have none. He did it again, and once again Rosberg himself contradicted Wolff. What a farce! I guess these lies have officially replaced the "he had the same problem, except it didn't affect him in any way whatsoever"-lie. And that's how he thanks them: By crashing into Lewis at the next opportunity. Happy that I could help. Back to Mercedes, very sad situation. Rosberg's mental state is very vindictive and angry. I think they should replace Rosberg with Hulkenberg or Wehrlein for 2017.
doing it for years and years, not just to LH but to many others too. their very best to hand him this win. He is such a nasty guy that he even blocked of the outside of the track to stop Lewis coming back on. Please, please, please, please win the WDC this year Lewis!! haha!! Lewis thinks he may have to start two more times from the back of the grid due to engine-related penalties. Then add Mercedes' uncanny ability to almost always come up with *something* to screw with Lewis' weekends, and it seems very unlikely that he can win it this season. Only if Rosberg starts having those problems, too... but in reality, not just imagined by Wolff.